Capriccio showing a garden building in the form of a three-bay triumphal arch, with a coffered niche inserted into the central opening. The building is set above a small lake surrounded by groups of trees. 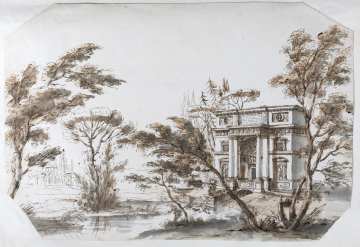 You are here: CollectionsOnline / Capriccio showing a garden building in the form of a three-bay triumphal arch, with a coffered niche inserted into the central opening. The building is set above a small lake surrounded by groups of trees. The architectural composition here is close to a larger scheme at Adam vol.55/174, which is part of a series of similar academic exercises. Their source may lie in the various projects of the early eighteenth century for the Trevi Fountain in Rome, in particular that of Nicola Salvi, which would provide both the central niche and watery setting. Robert Adam was certainly impressed by the Trevi Fountain and owned a number of drawings of it (see Adam vol.56/55, vol.56/56 and vol.56/57). The landscape here is similar to those in the Adam sketchbook in the Pierpont Morgan Library, New York (1954.14) and other compositions such as that by Adam in the style of Jean-Baptiste Lallemand (1716-1803) in Adam vol.56/54, although the building here is in much closer focus. The trimmed corners of this drawing show it has been moved from a previous location; this trimming has also presumably removed Adam's signature that was almost certainly next to the date in the lower left corner.